In the latest of our recollections on individuals who became synonymous with the 1966 World Cup, we turn the spotlight on the man who would forever known as the ‘Russian linesman’ – Tofiq Bahramov, from Azerbaijan. During the first period of extra time in the 1966 World Cup final, a linesman by the name of Tofiq Bahramov was elevated from being a footnote in the match into playing a major role that would long be recalled. With the game locked at 2-2, Geoff Hurst’s shot struck the underside of the bar and bounced down and out amid confusion over whether it had crossed the line. “No, no, the linesman says no,” said BBC commentator Kenneth Wolstenholme amid the uncertainty. Swiss referee Gottfried Dienst went over to consult Bahramov with nobody still any the wiser what was going to be decided. Wolstenholme referred to “the linesman who can only speak Russian and Turkish” as he waited for the decision (a delay probably not helped by language barriers). And so it began. The goal was given, England went on to win and the never-ending legend of the ‘Russian linesman’ was born. The moment that changed Tofiq Bahramov’s life. But as those in the know will like to point out, Bahramov (or Bakhramov as some sources name him) was not, in today’s terms at least, Russian. He came from Azerbaijan. However, it should be remembered that at the time it was part of the Soviet Union and there was a tendency to refer to anyone from the USSR as ‘Russian’ and the nation’s football team would often be called Russia in match reports etc. It is little wonder then that the ‘Russian linesman’ tag stuck, even after the break-up of the USSR. 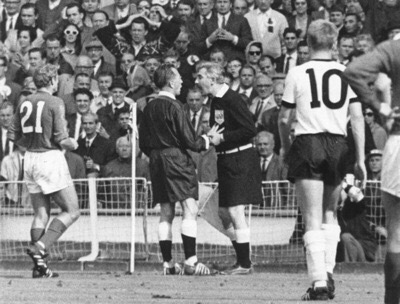 Bahramov checks his watch before the 1966 World Cup final. 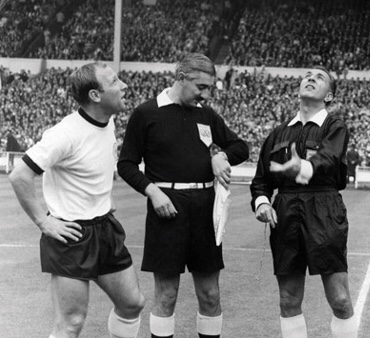 When Bahramov arrived in England to officiate at the 1966 World Cup he was 41 years old, having become a referee after his playing career was curtailed by injury. As was the case until relevantly recently, match referees at the tournament would double up as linesmen in other games. Bahramov was referee as Spain beat Switzerland in the group stage, but it would be while running the line that his tournament was best remembered. He performed the duty at the tournament opener between England and Uruguay and almost three weeks later was back at Wembley for the final. Bahramov could quite feasibly have been blocked from participating in the final due to the Soviet Union’s progress in the tournament. They reached the semi-finals and met West Germany at Goodison Park, where they lost. Out of the USSR’s exit came the chance for Bahramov to grace football’s biggest match. And that one moment would catapult him into the spotlight. The debate has continued for the last 50 years over whether the ball crossed the line. Earlier this year Sky Sports claimed they had proved it had, but that will never silence the naysayers. Modern technology has also been used previously to suggest the ball didn’t cross the line. There’s never likely to be an end to the debate. The statue in Bahramov’s honour in Baku. Whatever decision Bahramov made would have been criticised, so fine were the margins. But like Hurst, plenty of Englishmen would have happily shaken Bahramov’s hand if they had the chance. During that trip to Baku in 2004, England fans wore red shirts with ‘Bahramov 66’ on the back in his honour. 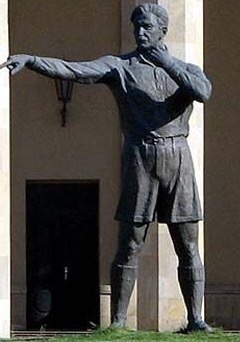 Bahramov died in March 1993, a few weeks after the death of Bobby Moore. In different ways both men made a big contribution to England’s success in 1966. And in their respective homelands, the pair continue to revered today more than 20 years after they died. The ‘Russian’ linesman from Azerbaijan will never be forgotten.